The Smithsonian’s National Zoo celebrated the birth of a male baby western lowland gorilla on Sunday—the first time in nine years that staff at the zoo have managed to get the critically endangered species to breed in captivity, the institution wrote in a blog post. Animal care staff have observed Calaya nursing the infant who has been clinging closely to his mother, and they are cautiously optimistic that the newborn will thrive. Animal care staff are leaving Calaya to bond with and care for her baby without interference. 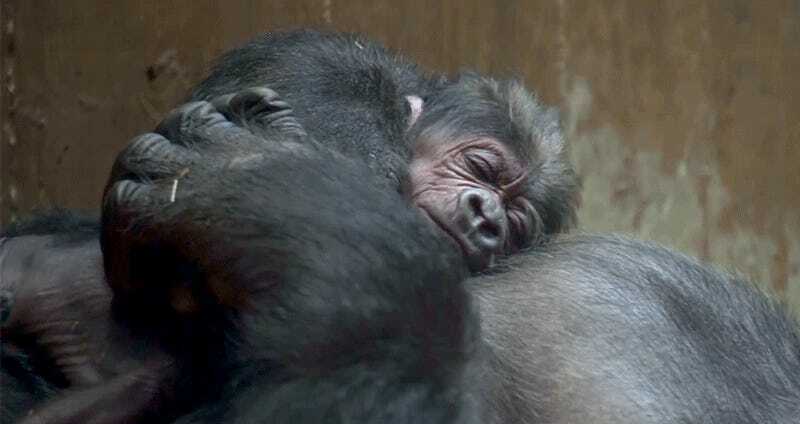 The Great Ape House is closed to provide Calaya a quiet space to bond with her infant. A video of the birth. (WARNING: It shows a lot of gorilla). Calaya and Baraka hit it off right away, [assistant curator of primates Becky Malinsky] said recently, and they mated within an hour of meeting. “It was love at first sight,” she said. Even before they met, when he could only gaze at her from behind the glass of the enclosure where she was temporarily quarantined, she caught his eye. “We’re pretty certain that Baraka was taken by her, just based on his behaviors,” Malinsky said. Trainers had to prepare Calaya by presenting her with photos of mother gorillas, giving her a plush baby gorilla toy, and showing her how to nurse, the zoo added in the statement. Western lowland gorillas are critically endangered. The World Wildlife Foundation writes it is unable to come up with a reliable population count, since they live in some of the densest jungles in western Africa. But it estimates that poaching and disease have cut populations in the wild by 60 percent in the last 20-25 years. In any case, this has been a good week for cute animals. Did you know baby bears can purr? Did Facebook Sleuths Get to the Bottom of Minnesota&apos;s Mummified Monkey Mystery?